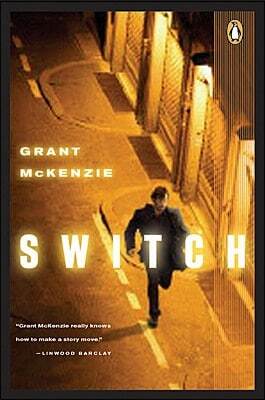 I decided to read Switch, by Grant McKenzie, because it sounded like an interesting premise for a novel. I enjoy most suspense novels and I knew that this was McKenzie’s first book, so I thought I’d take a chance and read it. Having read the book I’m finding it really difficult to describe the experience. The book begins with a murder, then the chapters begin flipping between two men who both seem to be having the same experience to a certain extent – they both go to a home and watch it blow up and believe that their family members have been murdered. These two men, Sam (whose house was destroyed) and Zack end up being brought together but an unknown man who wants to torture them both. As the novel continues, numerous characters appear with many twists and turns that include a mall robbery, a ransom demand, kidnapping, attempted murder and a suicide to name only a few. The novel continues on at a rapid pace until all is revealed by the novel’s end. There were some elements of the novel that I enjoyed. I liked the short chapter format (which reminded me of James Patterson’s novels) because it made the pace of the novel quite fast. I also enjoyed all of the action and some of the humourous comments that appeared intermittently throughout the novel – they were obviously small glimmers of the author’s Scottish humour peeking through. While I did enjoy some aspects of Switch, by the novel’s end I felt a bit cheated. The premise of the novel was interesting but its execution was lacking in some areas. I felt like the characters were two-dimensional — what McKenzie developed in terms of action he took away from the characters themselves. As well, at times, I felt that the novel was teetering precariously like a house of cards and, at any time, the plot was going to come crashing down because it lacked a strong foundation. Overall, whileÂ Switch had some interesting moments, it wasn’t a phenomenal book. That being said, it was McKenzie’s first novel, so I am hoping that he will learn to balance the action of the novel with the development of strong characters. I must say, as well, that I think this book could be developed into a great movie because it seemed more like a screenplay than a novel. The novel has potential, as does McKenzie, and I think both could be nurtured and developed more fully. I’m hoping McKenzie’s next novel will build the strengths that I found in Switch. Oh, this does sound like an interesting idea for a book!